The adorably lovable polar bear! Tickle her nose in a downward direction and she makes happy sounds - and sneezes! 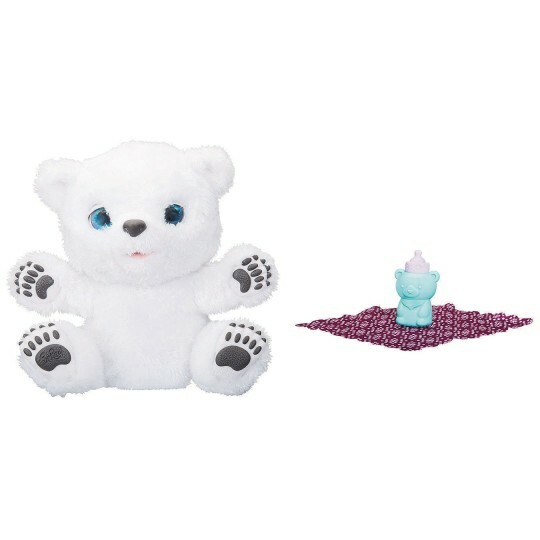 The Snifflin' Sawyer pet is a sweet baby polar bear who responds to touch with adorable sniffling, sneezing, and happy baby polar-bear sounds. Boys and girls alike can enjoy taking care of such a cute little cub! They can pet her on the head to comfort her, feed her with her bottle, and cuddle her with her favorite blanket. Tickle her nose in a downward direction and she makes happy sounds - and sneezes! Whether she's feeling fine or down with a case of the sniffles, the Snifflin' Sawyer pet is adorably loveable - and with poseable legs, she's a huggable cub, too!